Fresh from our kitchen to your table, we proudly serve our handcrafted breakfasts all day, every day. From our delicious local favorites, to our unique craveable creations, each dish is made-to-order and served with a smile! The best way to start your day is with one of our Welcome Classics. All served with your choice of two fluffy buttermilk pancakes, golden French toast, a cracked pepper-cheddar biscuit with savory sausage gravy, or toast. Satisfy your hunger with our tender and juicy 1-pound T-bone steak. * Served with two farm-fresh eggs• done your way and crispy golden hash browns. Nothing tops our mouthwatering top sirloin.• We cook it as you like it, and add two farm-fresh eggs• done your way and crispy golden hash browns. A Southern treat! Two crispy country fried steaks smothered in our savory sausage gravy, with two farm-fresh eggs* done your way and crispy golden hash browns. There's nothing standard about this breakfast. Two farm-fresh eggs• served with your choice of Applewood-smoked bacon, grilled sausage or Zenner's Double Smoked Sausage. Plus, your choice of two fluffy buttermilk pancakes, golden French toast, hash browns & toast or a cracked pepper-cheddar biscuit with savory sausage gravy. Breakfast doesn't get any better than this. Three farm-fresh eggs scrambled with diced country ham and cheddar cheese. Served with two fluffy buttermilk pancakes, crispy golden hash browns, Applewood-smoked bacon and grilled sausage. Prepare to be blown away. We start with a generous portion of crispy hash browns, add Applewood-smoked bacon, country ham, sausage, diced peppers, onions and cheddar cheese, and top it all with two farm-fresh eggs.• Served with your choice of two fluffy buttermilk pancakes, golden French toast, a cracked pepper-cheddar biscuit with savory sausage gravy, or toast. We’re proud to bring you the finest-quality Northwest ingredients in our Signature Sweets. 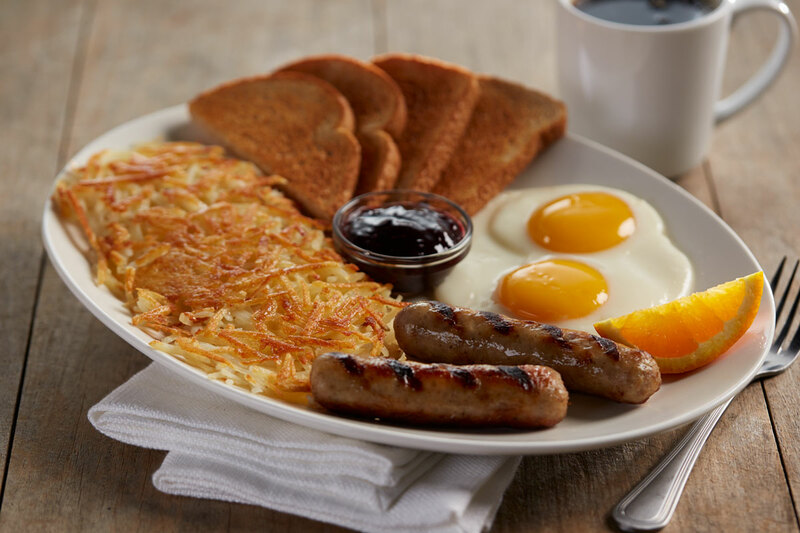 All combos are served with two farm-fresh eggs* and your choice of two strips of Applewood-smoked bacon, two grilled sausages or one Zenner’s Double Smoked Sausage. Three fluffy buttermilk pancakes. The best you've ever tasted. We dip thick slices of sourdough in our special batter and griddle them to golden perfection. You're in for a very special treat. Thick, crispy, yummy waffle made from our own secret recipe. Add our marionberry topping with fresh whipped cream and powdered sugar to your selection for an indescribable treat. At Shari’s, we take pride in our eggs Benedict dishes. From our farm-fresh eggs to our creamy hollandaise sauce to our locally sourced English muffins, you can taste the care we put into each and every dish. Each Benedict is served with crispy golden hash browns. Can you improve on a classic? You can when you use two farm-fresh poached eggs,* tender grilled ham and a griddled and buttered English muffin and top it all off with our creamy hollandaise sauce. The breakfast classic lightens up! We start with two farm-fresh poached eggs,* griddle an English muffin to perfection, add sliced avocado and tomato, then pour on creamy hollandaise sauce. Try this countrified version for a delectable change. Made with two farm-fresh poached eggs• and hearty grilled sausage set atop a cracked pepper-cheddar biscuit covered in savory sausage gravy. A classic goes Northwest hearty! We start with tender, marinated tenderloin steak tips• on a griddled and buttered English muffin, top them with two farm-fresh poached eggs,* pour on our creamy hollandaise sauce, then top it all with crunchy onion tanglers and green onions. Long before you woke up, we were hard at work handcrafting our craveable quiches. Each is made with quality regional ingredients like farm-fresh eggs, fresh heavy cream, locally grown fresh spinach and Swiss and cheddar cheese. Our house-made quiche topped with crispy Applewood-smoked bacon and cheddar cheese. Served with fresh fruit. Topped with fresh, locally grown vegetables and cheddar cheese. Served with fresh fruit. 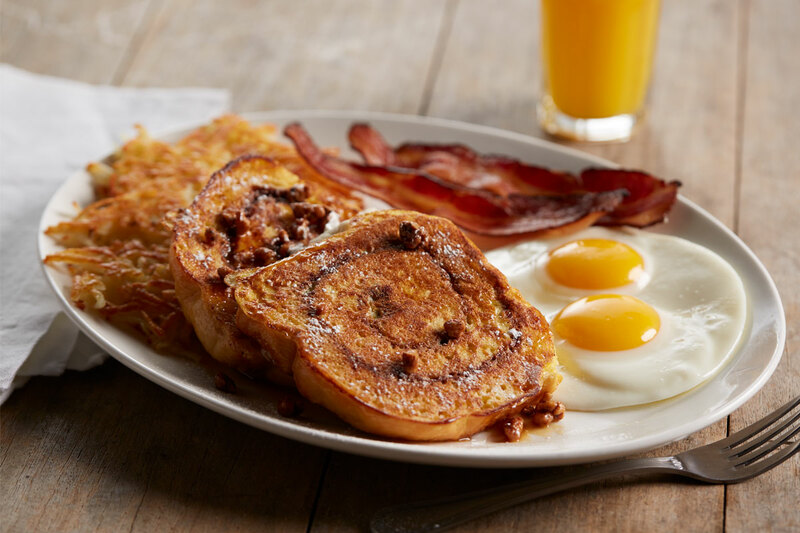 At Shari’s, we don’t like to play favorites but we’ve built some especially tasty three-egg combinations just for you! Taste the cheesy goodness that blends perfectly with the hearty flavor of our griddled ham. You'll get a kick out of this one. With Applewood-smoked bacon, mushrooms and pepper jack cheese topped with olives and green onions. Just the way our founder liked it! With smoked country ham, green peppers, onions and melted cheddar. This one will keep you coming back for more! Wait until you taste this incredible combination, with our locally grown baby spinach, tomatoes, fresh sauteed mushrooms and cheddar cheese topped with sliced avocado, tomato and bleu cheese crumbles. Our favorite way to enjoy it is omelette-style. We load them up so you can share with friends and family. We start with crisp golden tater tots and up the flavor by adding Applewood-smoked bacon, cheddar cheese and scallions with ranch dressing and tangy BBQ sauce for dipping. Mozzarella may be Italian, but these are pure Northwest delicious! Enjoy these crispy, gooey cheese sticks with our fresh marinara sauce for dipping. Try a little tenderness! Our locally sourced all-white-meat chicken tenders are lightly fried to a crispy golden brown. Pass them around and enjoy with our creamy ranch and BBQ dipping sauces! You'll definitely want to tangle with these bad boys. Battered and lightly fried to perfect crispiness, they are then piled high. Served with a generous portion of our chipotle ranch for dipping. It doesn't get any heartier or tastier than this! Our nachos are topped with tender pulled pork, house-made crispy chips and finished with handcrafted guacamole, pico de gallo, cheddar and pepper jack cheeses, sliced black olives, spicy queso and a big dollop of fresh sour cream and green onions. This is extreme all right! Extremely tasty. Three distinctly different dips - creamy spinach & artichoke, spicy queso and house-made guacamole - served with crispy tortilla chips for dipping. Why settle for one when you can have all four! Pass around the crispy tater tots, crunchy onion tanglers, cheesy mozzarella sticks and all-white-meat chicken tenders. Served with marinara sauce, BBQ sauce and chipotle ranch for dipping. At Shari’s we make the freshest salads you’ve ever tasted. But there is one person who can make them even better -you! So, we let you choose your favorite garden-fresh salad as a base and then give you all the delicious options you need to create one that’s all your own! It all comes together – just like you like it! Romaine lettuce tossed in our delicious Caesar dressing, topped with parmesan cheese and crunchy croutons. Fresh spinach with diced tomatoes, red onions, craisins, candied pecans and crispy croutons, topped with raspberry vinaigrette dressing and a hard-boiled egg. Chilled iceberg lettuce wedges topped with grape tomatoes, red onions, Italian vinaigrette and bleu cheese dressings and Applewood-smoked bacon. Crispy romaine and spring mix with diced tomatoes, sliced zucchini, green onions, sliced olives, cucumbers, bleu cheese, sliced almonds and crunchy croutons. The Northwest is soup country. And Shari’s hot, hearty soups are a delicious way to take the chill off and warm you up inside. No matter which one you choose, you can be sure it’s made with the finest, high-quality ingredients. It’s the only way Shari’s does soup! LIMITED TIME SEASONAL SOUP: Made with ingredients at their peak season. Ask your server about today’s selection. *Department of Public Health Notice: Meats or eggs that are undercooked to your specification may increase your risk of foodborne illness, especially if you have certain medical conditions. Additional written nutrition informabon is available to guests on request. The Northwest is home to the finest-quality beef and cheese in the world. At Shari’s, we’re proud to bring this bounty to your table. Our Signature Melts and Burgers are made exclusively with fresh, never frozen, premier Double R Ranch® beef from the Okanogan region of north-central Washington. And we proudly serve Tillamook® cheddar from the farmer-owned dairy co-op in Tillamook, Oregon. Our mouthwatering burgers are grilled on an open flame and served with your choice of Shari’s long-cut fries or tater tots or substitute with one of Shari’s sides. Or go big with one of our Premium sides for only 1.29 more. You’ll melt for our mouth-watering patty melts. Grilled to order so they’re always hot, fresh and delicious and served with your choice of Shari’s long-cut fries or tater tots or substitute with one of Shari’s sides. Our melt may be traditional but it's anything but boring. We start with the freshest beef patty,* Swiss cheese and Thousand Island and put it all together between slices of fresh marbled rye griddled to perfection. You won't find a better bacon and cheddar. Made with a fresh beef patty,* Applewood-smoked bacon, Tillamook® cheddar, caramelized onions and mayonnaise, griddled to golden perfection on fresh marbled rye. Why go East when you can go to Shari's for a tasty Philly-style melt? Made with a fresh beef patty* seasoned to perfection, grilled peppers & onions and melted Swiss and mayo between thick-cut slices of grilled parmesan-crusted sourdough. This melt is double good! You get a fresh beef patty,* tender roast beef in tangy BBQ sauce, cheddar cheese and crispy onion tanglers between thick-cut slices of grilled parmesan-crusted sourdough. Our flavorful.juicy burgers are made with always fresh, never frozen, locally sourced beef, cooked to order then placed on a crispy, grilled split-top potato bun. Served with your choice of Shari’s long-cut fries or tater tots or substitute with one of Shari’s sides. A Southern classic done Northwest-style! A crispy Belgian waffle filled with Applewood-smoked bacon, cheddar and green onions, topped with crispy chicken tenders and drizzled with chili-maple syrup. A must-have on a chilly day - or anytime! Hand-carved turkey breast, creamy mashed potatoes and house-made stuffing layered on a slice of thick-cut sourdough. Topped off with hearty turkey gravy and cranberry sauce. The king of comfort food. Hand-carved meatloaf on parmesan­crusted sourdough with creamy mashed potatoes and caramelized onions and topped with our rich demi-glace. Melts and Dips listed below are served with your choice of Shari’s long-cut fries or tater tots or substitute with one of Shari’s sides. Definitely craveable. Hand-carved meatloaf, cheddar cheese and crispy onion tanglers between grilled parmesan-crusted sourdough. We've taken the tuna melt to a whole new level. House-made albacore tuna salad on grilled parmesan-crusted sourdough with cheddar cheese, bacon and fresh avocado. More of what you love - cheese! Cheddar, pepper jack and Swiss layered with tender, hand-carved ham on thick-cut parmesan-crusted sourdough griddled to mouthwatering golden deliciousness! Tender slices of roast beef piled high on a crusty, grilled French roll and served with hot au jus. French dip with a Philadelphia accent! Tender slices of roast beef topped with Swiss cheese, grilled onions and peppers, piled high on a crusty, grilled French roll and served with hot au jus. *Department of Public Health Notice: Meats or eggs that are undercooked to your specification may increase your risk of foodborne illness, especially if you have certain medical conditions. Additional written nutrition information is available to guests on request. We've given the traditional chicken club a kick. Made with tender Cajun-seasoned chicken breast, Applewood-smoked bacon and fresh avocado. Bacon makes everything better. Layered and stacked with Applewood-smoked bacon, lettuce and tomato. A mouthwatering Northwest combo! Sliced tender roast beef paired with Applewood-smoked bacon and Swiss cheese. Go with a sure thing! Sliced turkey breast and Applewood-smoked bacon, lettuce and tomato. Shari’s pot pies are always hearty, hot and comforting. Made with the highest-quality, locally sourced ingredients, these classic dishes boast unique twists only Shari’s could provide. The beef makes all the difference! Handcrafted with tender, marinated tenderloin sirloin tips, creamy mashed potatoes, onions, fresh peas and carrots, and sliced mushrooms in a robust demi-glace. Wait 'til you taste our version of this classic! A creamy filling with oven-roasted, pulled chicken, carrots, celery, onions and peas, topped with toasted house-made stuffing. Long before you woke up, we were hard at work handcrafting our craveable quiches. Each is made with quality regional ingredients like farm-fresh eggs, fresh heavy cream, locally grown fresh spinach and Swiss and cheddar cheese. Served with a dinner salad or Caesar salad. This all-time favorite is made to please with Applewood-smoked bacon and cheddar cheese. Relax and enjoy! What could be better? Garden-fresh, seasonal vegetables grown right here in our part of the country and cheddar cheese. The perfect pair! Our delicious, homestyle entrees are all made-to-order and sure-to-please! Upgrade one of the side choices to a Premium Side for 1.29 more. Light but full of flavor! Made fresh with lemon-pepper chicken breasts grilled to juicy perfection, fluffy rice pilaf and garden-fresh steamed broccoli. Our favorite fish done our favorite way! Wild Alaskan salmon fillet seasoned and blackened, served with fluffy rice pilaf and garden-fresh steamed broccoli. Treat yourself to the best of the South! Two tender, homestyle country fried steaks smothered in savory sausage gravy and served with creamy mashed potatoes and garden-fresh steamed broccoli. Prepare to be delighted! Tender mac & cheese loaded with roasted pulled chicken, shredded cheddar, chopped Applewood-smoked bacon and a sprinkling of parmesan. The ultimate comfort meal! Thick slices of handcrafted meatloaf layered atop hearty mashed potatoes and covered in a robust demi-glace. Served with garden-fresh steamed broccoli. The best of the Northwest! Hand-cut, beer-battered cod fillets lightly fried and crispy. With creamy house-made coleslaw, tartar sauce and long-cut fries or tater tots. We pan-seared the beef until caramelized, then top with caramelized onions and sauteed mushrooms in a rich demi-glace. Served with fluffy rice and garden-fresh steamed broccoli. There's nothing more satisfying than our hand-carved slices of tender turkey breast, hearty mashed potatoes and stuffing topped with hot turkey gravy. Served with garden-fresh steamed broccoli, cranberry sauce and a cracked-pepper cheddar biscuit. You’ll love Shari’s USDA steaks. They’re flame-grilled to order and always tender, juicy and flavorful. This impressive piece of beef is considered among the highest-quality steaks, containing both the short loin and tenderloin. Seasoned and grilled on an open flame for maximum flavor, it's served with garden-fresh steamed broccoli and your choice of a Shari's side. Tender, juicy and flavorful, our grilled top sirloin* is always a delicious choice. Enjoy it with garden-fresh steamed broccoli and your choice of a Shari's side. RIGHT SIZE. RIGHT PRICE. RIGHT TIME (ANY TIME). Just the way our founder liked it! A two-egg omelette with smoked country ham, locally grown green peppers, onions and tomatoes. Thick slices of sourdough dipped in our special batter and griddled to golden perfection. Fresh spring greens, grape tomatoes, sliced cucumber and crunchy croutons topped with a grilled chicken breast. Petite iceberg wedge topped with grape tomatoes, red onions, Italian vinaigrette and bleu cheese dressings and Applewood-smoked bacon. Topped with a grilled chicken breast. Sliced turkey or ham on thick-cut parmesan-crusted sourdough bread, paired with a cup of today's soup. Our tender mac & cheese is finished with a sprinkling of parmesan. A tender, homestyle country fried steak smothered in savory sausage gravy, and served with creamy mashed potatoes and garden-fresh steamed broccoli. The best of the Northwest! Hand-cut, beer-battered cod fillet lightly fried and crispy. With creamy coleslaw, tartar sauce and long-cut fries or tater tots. Handcrafted meatloaf atop hearty mashed potatoes and covered in a robust demi-glace. Served with garden-fresh steamed broccoli. Hand-carved slices of tender turkey breast, hearty mashed potatoes and stuffing topped with hot turkey gravy. Served with garden-fresh steamed broccoli, cranberry sauce and a cracked-pepper cheddar biscuit. Light but full of flavor! A lemon-pepper chicken breast grilled to juicy perfection, fluffy rice pilaf and garden-fresh steamed broccoli. Two fluffy buttermilk pancakes served with a scrambled egg and slice of Applewood-smoked bacon. Crunchy chicken tenders served with long-cut fries. Thick-cut French toast served with a scrambled egg and slice of Applewood-smoked bacon. Classic grilled cheese served with long-cut fries. A scrambled egg served with our golden hash browns and choice of Applewood-smoked bacon or grilled sausage. Grilled lemon-pepper chicken with creamy mashed potatoes and garden-fresh steamed broccoli. Fresh spring greens, grape tomatoes, sliced cucumber and crunchy croutons, topped with grilled chicken breast. Tender mac & cheese served with long-cut fries. Vanilla ice cream topped with chocolate syrup and fresh whipped cream. *Department of Public Health Notice: Meats or eggs that are undercooked to your specification may increase your risk of foodborne illness. especially if you have certain medical conditions. Additional written nutrition information is available to guests on request.